The Equal-i-zer weight distribution hitch is our best traditional style WDH. Read on to find out why. The Equal-i-zer hitch is a pioneer in weight distribution hitches with sway control. Progress Manufacturing, the maker of this WDH setup, has been in business over 70 years and has been making the Equal-i-zer hitch for a really long time. In other words, they have a proven system when it comes to spring bar style weight distribution hitches. If you are looking for a proven system that has been used by thousands of trailer owners, over countless towing miles, the Equal-i-zer WDH is definitely the right choice. Our top choice, the Andersen weight distribution hitch, offers some advantages to this spring bar system. Still, there are many people who like to go with 'traditional' products. In that case, the Equal-i-zer hitch is the way to go. There are several part numbers available for Equal-i-zer weight distribution hitches, so before you can make a purchase, you need to figure out which one is right for your trailer and tow vehicle. Keep reading below to learn more about this WDH hitch, and when it comes time to buy, see the section on choosing the right part number. The Equal-i-zer WDH utilizes trunnion style spring arms, which serve a couple of purposes. They provide 4 points of friction for the sway control (more on this in a bit). Trunnion arms also provide greater ground clearance than the round bar style spring arms that are common in cheaper WDHs, including the Fastway e2 hitch. It's not all unicorns and rainbows with the Equal-i-zer weight distribution hitch. This traditional style WDH has some disadvantages, the most obvious being the 'dance' you have to do when connecting or disconnecting your trailer and your tow vehicle. Using the tongue jack, raise both the trailer and rear of the tow vehicle so that the weight distribution arms are able to be installed onto the "L" brackets. Sometimes the tongue jack isn't able to raise the trailer and tow vehicle combination high enough, so you have to use the snap lever to manhandle the arms onto the brackets. Watch your back when you are doing this! As you can see, you have to raise/lower the trailer twice (including the weight of the rear of the tow vehicle during one of these times) each time you either connect or disconnect your Equal-i-zer WDH. This isn't a process unique to the Eqaul-i-zer line of weight distribution hitches, but rather a process you have to go through with any traditional style WDH that utilizes spring arms and brackets. Fun. But hey, look on the bright side! Your arms get a little workout. When your trailer isn't connected to your tow vehicle, you have to figure out where to put the WDH spring arms. One solution can be found in the hitch accessories section of the main WDH page. If this up down, up down process isn't appealing to you (and let's be honest, this is a real downside to this style of weight distribution hitch), then consider the Andersen weight distribution hitch, which doesn't require so much use of the tongue jack. You do not need to disconnect the Equal-i-zer hitch when you backup (something you have to do with some anti-sway mechanisms). The only caveat to that is the following statement from the owner's manual: Disengage weight distribution before towing or backing the trailer where there is a significant transition in grade which puts excessive strain on the hitch, e.g. backing from a flat street to a steep uphill driveway. With the exception of one Equal-i-zer WDH kit, the trailer hitch ball is a separate purchase. You will need to purchase the right sized trailer hitch ball for your application. Progress Manufacturing has what they call an Integrated Sway Control™ (ISC) feature in their Equal-i-zer weight distribution hitch. This 4-point system uses friction to reduce trailer sway while towing. There are two points of linear friction where the weight distribution bars (spring arms) intersect the "L" brackets (mounted to the trailer frame) and two points of rotational friction at the hitch head. The manufacturer claims this is equal to using eight add-on anti-sway bars. Properly setting up your WDH greatly enhances the anti-sway capability of this system. The disadvantage to this type of sway control mechanism is it can be noisy. Much of the sway control comes from metal-on-metal friction between the spring arms and the "L" brackets. This metal-on-metal sliding results in noises. Which can at times be very jarring and even disturbing. You cannot lubricate this contact area, as it will reduce the friction, which will in turn reduce the anti-sway capability. You just get to live with the creaking and groaning. This noise is just a by-product of this type of WDH system. It can be annoying at the least, and embarrassing at the most. Can You Eliminate The Creaking And Grinding? Part of the Equal-i-zer hitch's anti-sway capability comes from the friction between the weight distribution bars (spring arms) and the 'L' brackets. However, this friction point can cause clanking or grinding noises, particularly when making tight turns at slow speed. Here is what Progress Manufacturing has to say about this issue. Progress Manufacturing offers a Sway Bracket Jacket (say that 10 times fast) that is designed to reduce this noise that some people find to be annoying. The Sway Bracket Jackets will not fit the 4,000 pound (the light duty) Equal-i-zer WDH. They are designed for the 6,000 pound and above hitches. Equial-i-zer weight distribution hitches come in several different part numbers that all come standard with a 2" shank (to fit 2" receivers) and accommodate up to a 3" drop or a 7" rise. The major difference between part numbers is the weight capability of the hitch. Higher capacity hitches use heavier duty spring arms. The Equal-i-zer hitch comes in versions for the following gross trailer weights: 4,000 pounds, 6,000 pounds, 10,000 pounds, 12,000 pounds, and 14,000 pounds. Progress Manufacturing offers two online calculators to help you figure out which Equal-i-zer weight distribution hitch you need. A calculator to figure out shank size (also see the video in step #2 below) and a calculator to figure out what weight rating hitch you need. You will need to weigh your trailer to know what the weight rating of the hitch you use for your setup. 1. What hitch weight rating do you need? 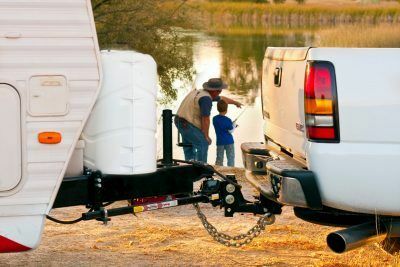 The weight distribution hitch you use will need to be capable of supporting the weight of your loaded trailer (or the gross trailer weight), but you don't want a hitch with too high of a weight rating or else it won't function properly. The key is to figure out your trailer's actual weight and tongue weight (as well as be aware of your trailer's maximum weight) and then pick a hitch with a rating above your trailer's actual weight (chose the next highest rated hitch, but don't go up multiple hitch sizes or else it won't function properly). Progress Manufacturing wrote this blog post to help explain how to choose the properly rated hitch. You can also use their online calculator. 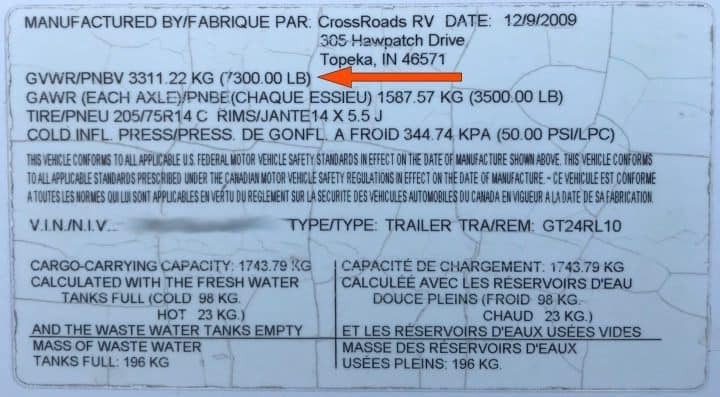 The gross trailer weight (also known as gross vehicle weight rating, or GVWR) can be found on a placard on your trailer (see below pictures for examples). While you can use the gross trailer weight rating to chose the correct hitch for your setup, it's often a much better idea to know the weight of your rig as you actually use it. Why does this matter? 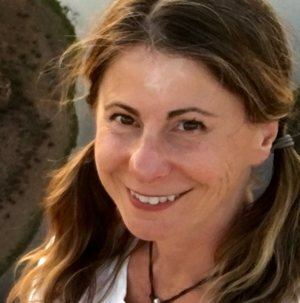 Well, in Kelly's case, if she was going off the GTW as indicated by the trailer manufacturer, she would need a 10,000 pound version of the Equal-i-zer hitch (the closest weight rating, without being under, to her GTW of 7,300 pounds). A 10,000 pound hitch is WAY overkill for her situation. The heavier the hitch rating, the stiffer the setup is going to be. A stiff setup is fine if you have a heavy trailer (you need it for proper sway control and weight distribution), but a super stiff setup on a light trailer is not necessarily a good thing. A heavier rated hitch than what you require can cause a stiffer ride, which may lead to premature wear of components. But more likely, it may result in an uncomfortable ride for tow vehicle occupants. Also, you will have to deal with much heavier spring bars, which are already a hassle to deal with, so why would you want to make your life that much harder? ​The above bits about not getting too high of a hitch weight rating​ doesn't apply to the Andersen WDH as it doesn't use spring bars. 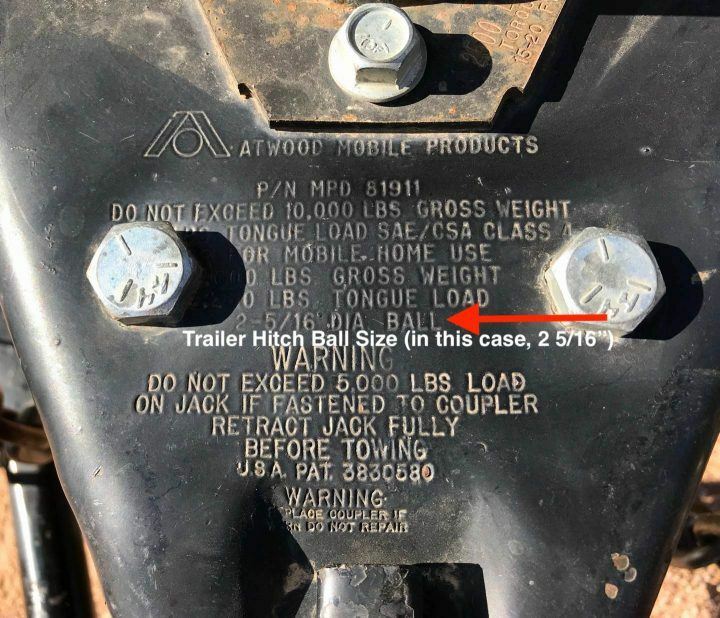 The Andersen weight rating is based off of hitch ball and receiver hitch size and one kit (of a certain ball and receiver size combination) fits a wide range of trailer weights. It's MUCH easier to figure out what kit is right for you when you ​​go with an Andersen WDH. 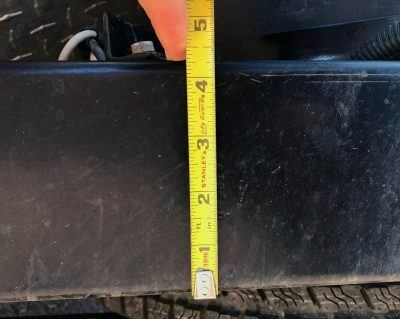 Because Kelly knows the ACTUAL weight of her travel trailer, as she uses it, she can have a weight distribution hitch that better matches what the real world weight of her rig is. In her case, the 6,000 pound Equal-i-zer hitch is more than enough for her particular situation. 2. What size shank do you need? In other words, how much rise or drop is there between the hitch receiver on your tow vehicle and the coupler on your trailer? To figure this out, see the video directly below and use this online calculator. The shanks that come standard with Equal-i-zer hitches allow for up to a 3" drop or a 7" rise. If you need a larger drop or rise, then you can purchase an Equal-i-zer hitch without a shank and purchase the correctly sized shank separately. This also applies if you have a 2.5" receiver as the standard kits are for 2" receivers. 3. What is the height of your trailer frame at the front of the trailer (the A-frame section that has the coupler attached to it)? Equal-i-zer hitches will fit up to a 6" frame. If you have a trailer with a 7" or 8" frame, then the Equal-i-zer hitch won't fit. In this case, you can use an Andersen WDH. Many travel trailers use a frame manufactured by BAL that measures 4 3/8" (when you measure the frame rails vertically). For example, the Lance travel trailer owned by Camp Addict Co-Founder Marshall uses this frame. 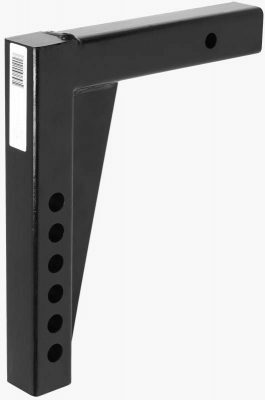 Problem is that Equal-i-zer frame brackets are designed for frames that measure full inches (for example, a 5" frame). If you use the standard bracket on your 4 3/8" frame, there will be a gap which is no good! It causes bracket slippage. Equal-i-zer tells you to use one of two solutions: 1) Use a shim to fill in the gap between the frame and the 5" bolt hole position. 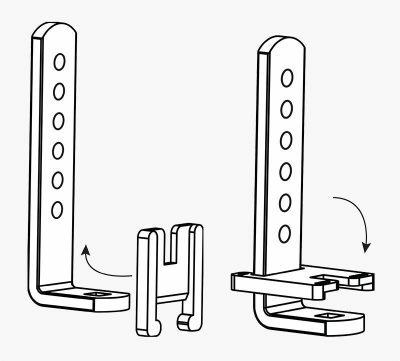 2) Buy special brackets (see below) that are designed to be used on 4 3/8" tall frames. Seems like option #2 would be the smarter way to go, but of course, it costs more money. Your choice! There is one more item to take into consideration - the size of receiver opening your tow vehicle has. Most vehicles will have a 2" receiver opening, which is the size that Equal-i-zer WDH come standard to fit. The Equal-i-zer hitch 'plugs' into your tow vehicle at the trailer hitch receiver (pictured below). The shank (what Progress Manufacturing calls the part that attaches directly into your tow vehicle) that comes with an Equal-i-zer WDH system is designed to fit the standard sized receiver openings. However your vehicle might have a larger receiver opening, so you have to make sure you order the correctly fitting part. Equal-i-zer hitches come standard with a shank to fit a 2" receiver opening. This will fit most standard hitches (Class III and Class IV hitches - learn about hitch classes in the weight distribution hitch guide). If you have a heavy duty truck, you may have a Class V hitch, which might have a 2 1/2" or a 3" receiver opening. If you have a 2 1/2" receiver, you can purchase an Equal-i-zer hitch without the shank and purchase the correctly sized shank separately. It's a bad idea to use an adapter to fit a 2" shank into a 2 1/2" receiver as it generally reduces the weight you can tow with your setup. You NEED a shank that fits your receiver! Equal-i-zer doesn't offer a shank that fits a 3" receiver. Because using an adapter (to allow you to use a 2 1/2" shank in a 3" receiver) isn't a great idea, you should instead consider installing an Andersen WDH as they offer 3" receiver options. Once you've figured out your trailer's gross weight and tongue weight, along with what sized shank you need (how much drop or rise you have), it's time to order the correct Equal-i-zer WDH kit. If your tow vehicle has a 2" receiver and you can use the standard shank that allows for up to a 3" drop or a 7" rise, then simply order the part number with the correct weight rating shown in the table below. If you need a shank with more than a 3" drop or 7" rise or you have a 2.5" receiver on your tow vehicle, you can purchase an Equal-i-zer hitch without the shank and purchase the correctly sized shank separately. The shanks that come in Equal-i-zer hitch kits are for 2" receiver openings and accommodate up to a 3" drop or a 7" rise. If you need a shank with more of a drop or rise, and/or your tow vehicle has a 2.5" receiver, the standard kits won't work for you. Instead, purchase the appropriate shank separately and also buy the appropriately sized no-shank Equal-i-zer part number (see chart directly below). The shanks that come in Equal-i-zer hitch kits are for 2" receiver openings and allow for up to a 3" drop or a 7" rise. There are shanks available below that you can purchase separately that will accommodate more than a 3" drop or 7" rise and/or fit into a 2.5" receiver opening. You can purchase a shank by itself (see table below) and use it with an Equal-i-zer WDH that is available without the shank. This allows you to customize your weight distribution system in case the standard shank doesn't fit your tow vehicle and trailer combination. Shanks for the 4,000 pound Equal-i-zer WDH are lighter duty and are not compatible with the higher weight rated hitches. The 6,000 thru 14,000 gross trailer weight rated hitches all use the same hitch (which is not compatible with the 4,000 pound hitch). Except for one version of the 10,000 pound setup, Equal-i-zer hitches do not come with a hitch ball (the round part of the hitch assembly that the trailer's coupler rests on), so you have to supply your own. Depending on what your trailer requires, you will need to purchase either a 2" ball or a 2 5/16" ball. The diameter ball required is generally stamped on the trailer coupler (the part that rests on the ball). See below image for an example. Per the Equil-i-zer weight distribution hitch owner's manual: Using a hitch ball with a shank longer than 2‐3/8” may damage hitch and could void your warranty. 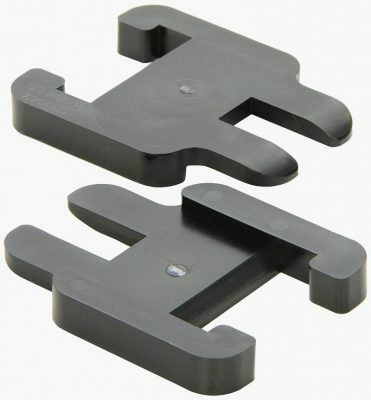 Progress Manufacturing offers hitch balls (see directly below) that work perfectly with their hitches, so it might be a good idea to purchase one of theirs. Below are the hitch balls that Progress Manufacturing offers and which work perfectly with their Equal-i-zer WDH systems. They are made from chromoly steel and have a 2 1/4" long threaded shank that is 1 1/4" in diameter. There is only one weight rating on the 2" ball (less common size) and three different weight ratings for the 2 5/16" ball. Choose the weight rating that is above the gross vehicle weight (GVW) of your trailer. Click on the part number to view pricing on Amazon. The installation of an Equal-i-zer weight distribution hitch can be a bit tricky. You have to play around with a combination of washers in the hitch head (that adjust the head angle) and height of the "L" brackets, in order to get the proper weight distribution setup. The good news is that this is generally a one-and-done procedure (assuming the weight of your trailer doesn't appreciably change). 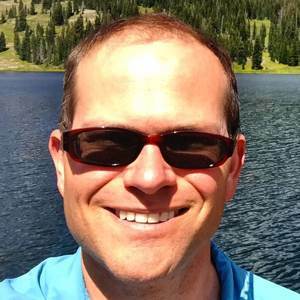 The bad news is this can be a time consuming and frustrating process. The video below (sorry about the crappy quality - that's the best that's available) shows the steps you have to take to get this weight distribution setup dialed in. Periodic lubrication of the Equal-i-zer hitch is required per the below graphic (click to enlarge). The manufacturer recommends their high performance lubricant. The Equal-i-zer trailer hitch manual states the following: "Do not tow with your hitch engaged on rough roads, through profound ditches, dips and swales, or while launching a boat. Excessive strain on the spring arms and hitch head may cause hitch fatigue or failure." If you are a heavy boondocker, or otherwise find yourself frequently towing your trailer down rough/ bouncy/ poorly maintained roads, then pay attention. Download the Equal-i-zer WDH installation manuals here. View FAQs for the Equal-i-zer weight distribution hitch here. Standard Equal-i-zer shanks allow for up to a 3 inch drop or a 7 inch rise. If you need additional drop or rise, you can purchase an Equal-i-zer hitch without a shank and purchase the correct sized shank separately. Hitch ball is extra (except for one kit which includes a ball), but Progress Manufacturing offers them as an additional purchase.